The BC Lions have added veteran depth to their running back position with the pending announcement that they have signed import free agent Jamal Robertson. 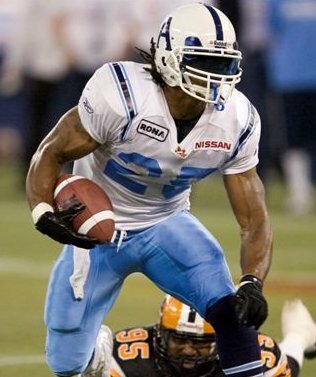 Robertson became a free agent this off-season and talks soon broke down with the Argonauts. At 33 years of age Robertson will be competing for the running back spot with young talents Jamal Lee and Andrew Harris. He was the first Argo to rush for 1000 yards in 8 years in 2009 and added 9 touchdowns. Robertson is a powerful back who runs hard, similar to the departed Martell Mallett. This is the first deal that sees a former Argo come to the Lions since Lions owner David Braley bought the Argos, but considering talks with the Argos broke down long ago, there shouldn’t be a lot of questions raised about the signing. The signing is the latest in a good string of off-season moves by the Lions, who still must address their linebacking depth and bring in some more competition and depth for the offensive line.